They went first along a black passage, then up many wet steps, and so came to a small flat landing cut in the stone and lit by the pale sky, gleaming high above through a long deep shaft. From here two flights of steps led: one going on, as it seemed, up on to the high bank of the stream; the other turning away to the left. This they followed. It wound its way up like a turret-stair. At last they came out of the stony darkness and looked about. They were on a wide flat rock without rail or parapet. At their right, eastwards, the torrent fell, splashing over many terraces, and then, pouring down a steep race, it filled a smooth-hewn channel with a dark force of water flecked with foam, and curling and rushing almost at their feet it plunged sheer over the edge that yawned upon their left. A man stood there, near the brink, silent, gazing down. Rangers are brave men doing what is right an fighting for justice without seeking fame nor recognition for themselves. They are faithful servants to all men in Middle-earth, working in the shadows to waylay and cripple the Enemy wherever they can. The Ithilien Rangers, loyal to Captain Faramir, were dressed in camouflaging green and brown. They had their hidden outpost in Henneth Annûn, a cave behind a waterfall also known as the Window on the West or Window of the Sunset. Above the waterfall, there was a flat rock that provided a view on the Realm of Gondor. 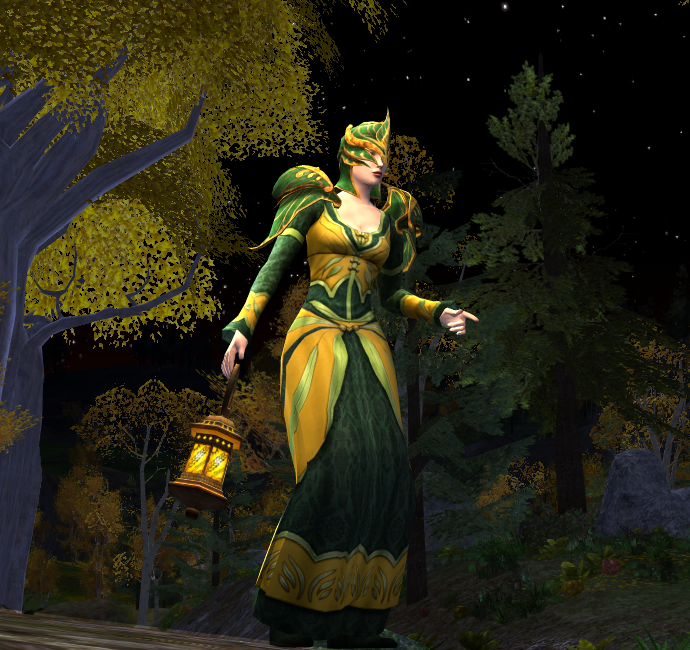 I created my first Ithilien Ranger outfit in May 2011. It was one of my very early outfits created with whatever was available to me at the time. It still looks great but so very dated! The game has added tons of new cosmetic items and colors since then so I decided to redo this one. I like the idea of going back to old favorite outfits and update them with new options. The chest piece in this outfit comes from the Coffer of Traveller’s Armour boxes that are available from the Quartermaster at the Bree Fountain. All those box armour pieces are sort of ugly, because they look worn and have a “dirty” dye base, but this is quite perfect for a ranger who spends most of his time outdoors. I would say all these box items are actually quite perfect for any traveller who likes to use a worn look on their characters. The robe has a short (above the knee) appearance when equipped on female characters. I would have liked it to be that way for male characters as well. The long version isn’t bad looking, but a short version would have been more realistic. Still a very good rugged ranger robe. All nadhin sets drop at lvl 50ish wich make it possible to get a very similar look on legendary servers. That’s right! Not sure if you could get the robe though as it requires Motes? Haven’t been on the Legendary for quite a few weeks. Should check it out! You gain motes trough deeds, even low level ones. So yes definetly possible to get this chest piece. I got the heavy one for my captain. Super. Thank you for the replies! Very helpful!